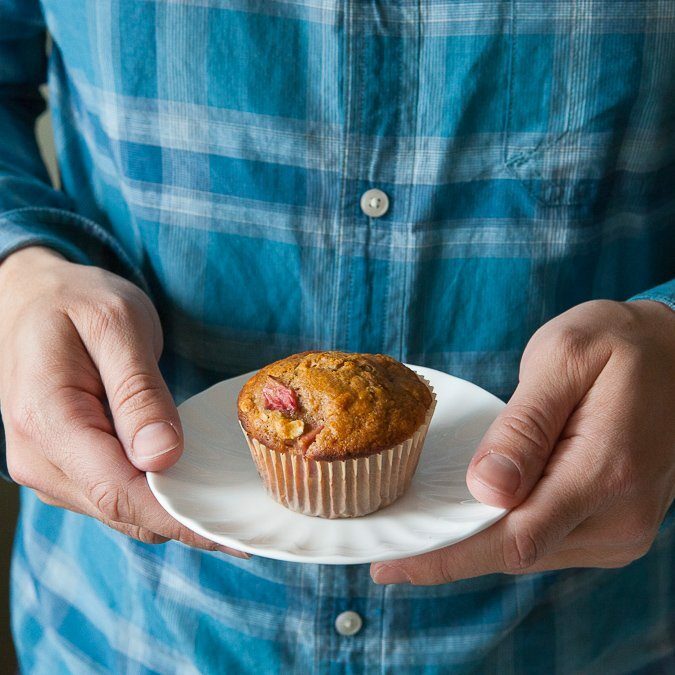 These muffins make for a stellar mid-morning snack, and while I loved them with roasted strawberries, I imagine you could use any berries you’d like here. I made a few tweaks to Andrea’s recipe based solely on what we had in the cupboards, and my changes are written in the recipe below. But just so you know, you can easily make these muffins dairy free: Andrea suggests using almond milk instead of milk; she also calls for walnut oil (but I opted for olive oil here instead). Preheat the oven to 350 F and line a baking sheet with parchment paper. Toss the berries with the oil, honey and salt. Place them on the baking sheet and roast until they’re juicy and reduced in size, about 25 minutes. Remove from the oven and let them cool slightly. If the berries are still rather large, slice in half so you have large chunks and reserve 3/4 cup for the muffins (if you have extra, use them on your morning yogurt or atop ice cream). Increase the oven temperature to 400 F. Line a standard muffin tin with paper liners or generously coat the tin with oil. In a large bowl, whisk together the flour, oats, baking powder, baking soda, cinnamon and salt. In a separate bowl, whisk together the egg, milk, oil, vanilla and honey. Pour the wet ingredients into the dry ingredients and mix until just combined. Gently fold in the reserved strawberries and stir until they’re evenly incorporated. Spoon the batter into the prepared muffin cups and bake until muffins are golden and a toothpick comes out clean when inserted in the center, 18-20 minutes. Let muffins cool for 5 minutes before using a knife to gently remove them from the pan and transfer to a wire rack to cool. Enjoy within 2 days or freeze for up to 1 month.